Storm Sails: Do you Need Them? Many sailors embarking on ocean passages will take along the obligatory storm jib and trysail, with the vague idea that they may come in handy. Few sailors, however, have a real understanding of how and when to set them. 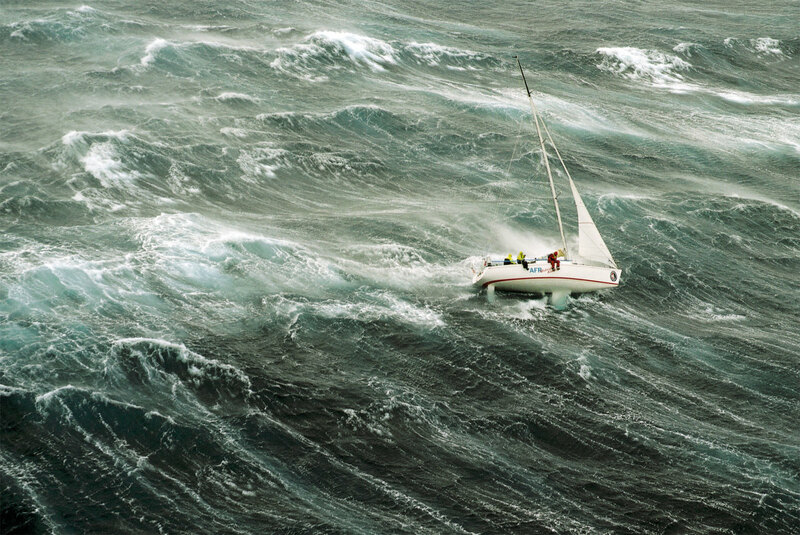 Survival storm conditions in the infamous 1998 Sydney-Hobart Race. Are you prepared to set sails in a blow like this? It doesn’t help matters when we hear from seasoned sailors who have rarely if ever needed to fly their storm sails. Similarly, while, a deeply reefed furling genoa is not very efficient—there is typically too much draft in the sail, which translates to increased heeling—there is no arguing that it can cope just fine with most conditions experienced by coastal sailors, in winds up to 30 knots. Same goes for the typical cruising mainsail with two reefs. When you are preparing for more ambitious passagemaking, however, the case for dedicated storm sails does become much stronger. Although a deeply reefed furling genoa is not very efficient—there is typically too much draft in the sail, which translates to increased heeling—there is no arguing that it can cope just fine with most conditions experienced by coastal sailors, in winds up to 30 knots. The same goes for the typical cruising mainsail with two reefs. When you are preparing for more ambitious passagemaking, however, the case for dedicated storm sails does become much stronger. If you are preparing to depart on an ocean passage, start by thinking about sail stowage. It’s an old joke among yacht brokers that the only two untouched sails on a typical cruising boat are the spinnaker and the storm jib. Typically, storm sails are buried in the depths of a locker or under a bunk, leaving the more accessible space for other items deemed more important. This is a mistake: nothing is more important than the safety of the boat and crew. So when you’re on passage, your storm sails need to be easy to locate and ready to use. Next, before you leave the dock, practice setting your storm sails—and ignore the sideways glances from your neighbors! There are a number of reasons for doing a dry run, the most important of which is to find and mark the location of the sheeting positions for the sails. As a first step, adjust the jib’s tack pennant, a length of sturdy line or wire bent on to the tack of the storm jib that allows you to raise the sail up off the foredeck so that waves can wash under and not into it. How high you should raise the tack depends upon the size of your boat. It may also depend on your deck hardware, as you should adjust the pennant so that you can sheet the storm jib to your strongest turning block. Storm jibs have high clews to begin with, so you have some flexibility when it comes to sheet location. Raise the sail with a spare halyard until the sheet lead position, with the sail sheeted for sailing close-hauled, is in the right place. Then note the location of the tack and mark the length of the pennant at the base of the stay. When it comes time to set the sail in a storm, you need only attach the pennant at the base of the stay and hoist the sail. Your sheet lead will automatically be in the right place. The reason for having a tack pennant on a trysail is a little different. In this case, you want to be able to set the sail above your mainsail, which will be lashed to the boom. The stack height of a mainsail equipped with luff cars can be considerable, and you do not want any part of the sail to chafe against the trysail. Just as you did with your storm jib, select a sturdy sheeting point for your trysail. You can sheet it to the end of the boom, or to a strong point on either quarter. Sheet the sail to the strong point, hoist it with a halyard, and when the sheet lead is correct, mark the length of the tack pennant. As with the storm jib, your sail will sheet correctly when you set it to the pre-marked height. To consider other factors affecting storm sail construction and trim, let’s look at three different boats: a 36-foot modern coastal cruiser, a 50-foot bluewater cruiser, and 45-foot offshore racer. Like many other boats of this size and type, our 36-footer has a 130 percent reefing genoa on a furler. The sail has a two-ply leech and a foam luff that serves to flatten the sail when it’s reefed. 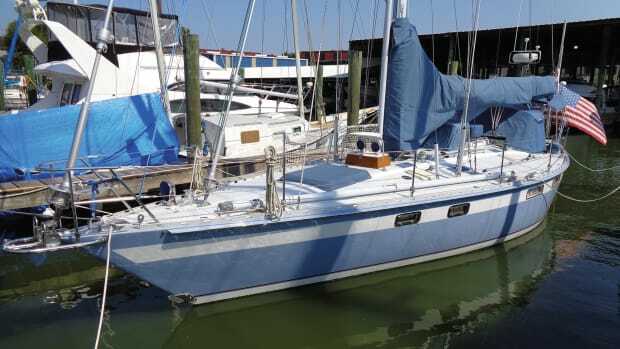 The sail is reinforced at certain places on the leech and foot where it can be reefed, but in no way should you believe that a reefed genoa can serve as an adequate storm sail. Here’s why: because the genoa will mainly be used in light winds, the sailmaker built it out of fairly light fabric, in this case Dacron. A second ply up the leech and along the foot adds necessary strength to high-load areas so the sail can be reefed in moderate conditions. But an adequate storm jib for a boat of this size needs to be built from heavier fabric if it is to withstand more extreme wind speeds. It should also have a high clew to keep it clear of seas and should be orange in color so it can be easily seen. In short, a genoa is definitely not up to the task. 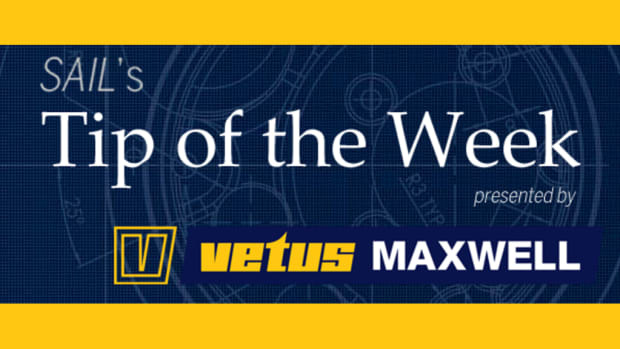 Ideally, your rigging would include an inner forestay on which to set a storm jib. Like most other coastal cruisers, our 36-footer does not have one of these—the skipper has never had reason to install one—so the storm jib must be set over the headsail that is rolled up on the forestay. It would be unwise to lower the already-set sail in order to use the groove in the furler rod for the storm jib, since this would mean unrolling the genoa while the wind is increasing. One solution is the Gale Sail, which has a sleeve that wraps around the furled-up genoa and is attached with large piston hanks, which are easy to manage with cold fingers. As the sail is hoisted, the Dacron sleeve of the Gale Sail slides over the Dacron fabric of the headsail with surprisingly little friction. If you have ever stepped on a flaked Dacron sail, you know how slippery Dacron-on-Dacron can be. You can hoist the Gale Sail using a spare genoa or spinnaker halyard. Once it is set, there is very little chafe as there is no point loading anywhere along the luff of the sail. The sleeve spreads the load across the entire length of the luff of the storm jib. With the tack pennant premeasured, the sheeting position will be in the correct place as soon as the sail is hoisted. Ideally, a storm jib should be set on its own stay well abaft the bow, so that the sailplan’s center of effort is kept close to the middle of the boat. The Gale Sail is set off the forestay, which is not a safe and convenient place to attach the sail—one of the drawbacks of the system. 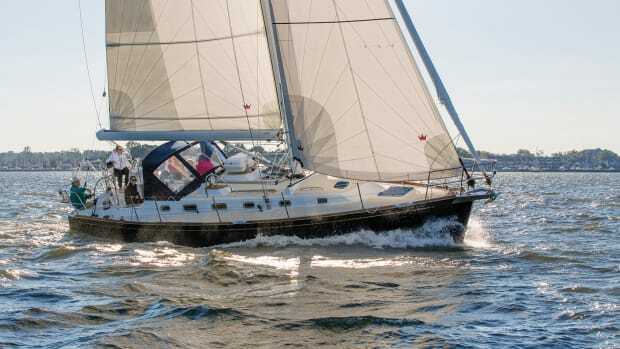 Even so, a purpose-built storm jib set securely over the furled headsail is adequate for gale force conditions—providing it is set up before conditions deteriorate too much. It would be no fun trying to rig such a sail while hanging onto a bucking bow pulpit. 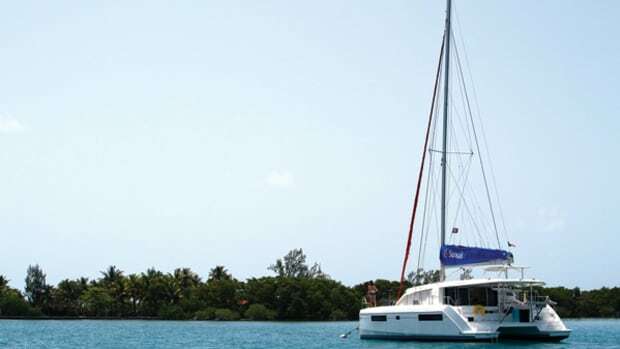 The cutter, which has a permanent inner forestay, is a popular rig for offshore sailing. This stay can be used for a heavy-weather staysail as well as a storm jib. Sails set on the inner forestay are usually clipped on with hanks, so it’s not a lot of work to lower and lash the staysail and then hoist a storm jib. 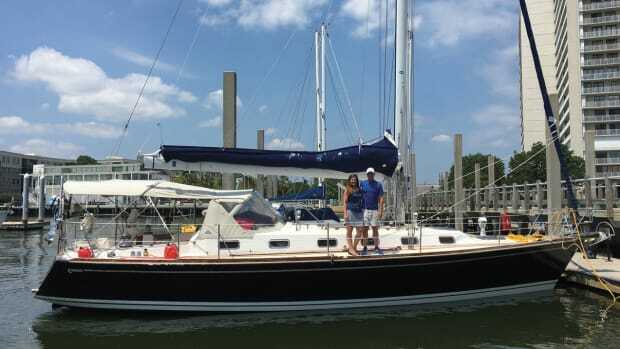 The cruising couple on the 50-foot bluewater cruiser in this example do have a permanent inner forestay, and they hank their storm jib onto that stay. The tack pennant keeps the sail up off the deck, which allows waves to pass underneath and also leaves room for the working staysail to remain attached to the stay and stowed in its own bag. The non-overlapping staysail itself, which is the size of a small working jib, is a useful heavy-weather sail that can be flown into quite high wind ranges before the crew starts thinking about dousing it in favor of a dedicated storm jib. Had the staysail been set on a furler, as many of them are these days, the crew could roll it away and set a Gale Sail over it from the comparative security of mid-foredeck. Because this couple likes to exercise an abundance of caution, they also have a separate track on the mast for their storm trysail. This is a very prudent set-up if you are planning to do any amount of bluewater sailing. Having a separate trysail track means you can lower and lash your mainsail without having to remove the slides from their track in order to set the trysail. Feeding slides onto a track is not something you want to be doing in a storm. In fact, this couple takes things one step further by having their trysail track run all the way down to the deck. This allows them to pre-load the trysail slides onto the track, attach the pennant and leave the trysail permanently bent on in its own custom bag at the base of the mast—a cautious approach if ever there was one. Be aware however that this approach does have its downsides. Specifically, the sail is always in the way, and even though it’s stowed inside a bag that protects it from the sun, the sail may suffer some degradation and may not be as strong as if it were stowed belowdecks. In the end, whether to use this approach is a matter of preference and perhaps age. A young, fit couple could get the trysail from below and load it onto its track without too much difficulty, so long as they do so long before gale-force winds hit. An elderly couple, on the other hand, might prefer the convenience of a separate trysail halyard already attached to a trysail that is already loaded onto the track. 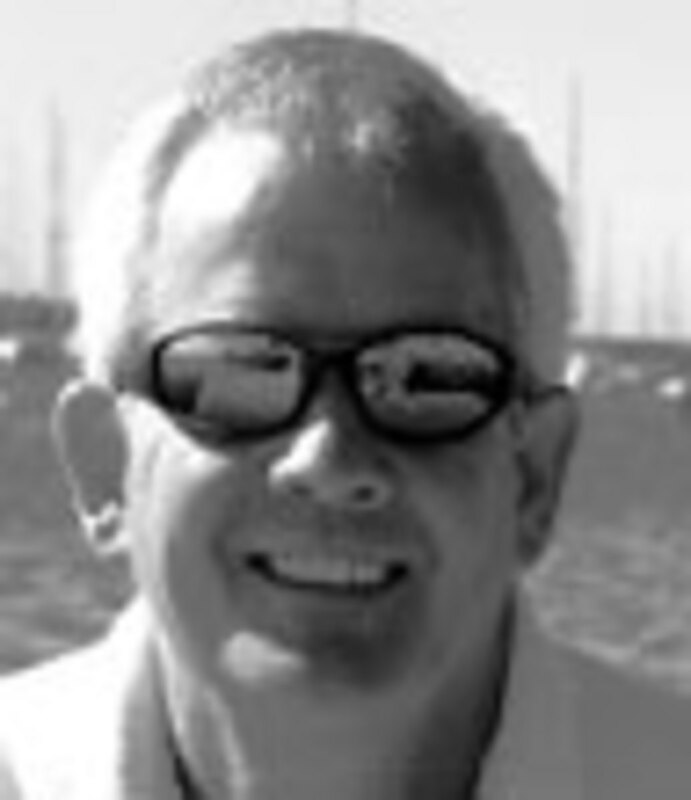 If our hypothetical boat did not have a permanent inner forestay, Chris Howes, a long-time sailmaker with Doyle Sails, recommends a storm jib set permanently on a torque-rope luff, could be used instead. Not only is it a cost-effective solution, but torque ropes are easy to coil and stow and can be built right into the luff of a storm jib. With a two-to-one halyard you can get sufficient tension on the luff and once hoisted it’s easy to unroll. One advantage of using your reefed mainsail as a storm sail is that it has a much more efficient sail shape than a trysail. Most trysails are cut very flat, and their geometry, with a long leech and foot relative to the luff, make them relatively inefficient, especially if you are the kind of sailor who likes to keep a boat moving during a storm. A moving boat gives you more maneuverability, which allows you to get out of the way of the biggest waves. On the other hand, many sailors simply view their trysail as a good sail for heaving-to and would rather save the wear and tear on their mainsail. If you are a racing sailor, you will also keep racing, but most of us will slow the boat down and take things cautiously. Our racers would like to have a roller-furling storm jib, as described above, but it’s out of their budget. Instead, they have a different setup. Their boat does not have a permanent inner forestay; instead, they use a very low-stretch aramid line that is fastened permanently to the mast a couple of feet below the masthead, high enough that it is not necessary to set running backstays to counter the load of the storm jib when it’s set. This “soft” stay is secured at the mast when racing, leaving the foretriangle open for quick and easy tacking. If the crew needs to set a storm jib, they attach the lower end of the aramid stay to a tackle on the foredeck and lead the fall of the tackle back to a winch, so they can tension the stay. 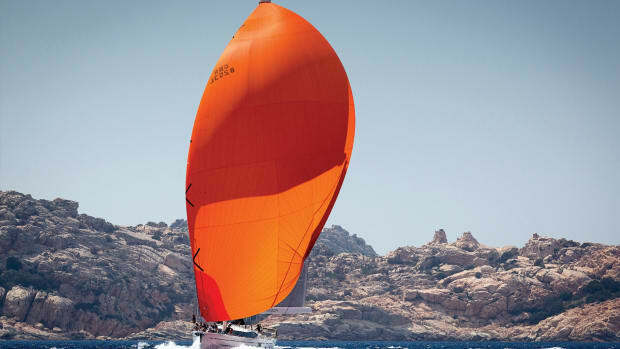 Their storm jib is bright orange for visibility and has soft hanks along the luff. These hanks are made from webbing strops that do not chafe the aramid stay; they easily wrap around the stay and fasten back on themselves. This rig is light and easy to set up, but is not recommended for extensive offshore sailing. In big winds and high seas, multihulls require sailing different techniques to the typical cruising monohull—control of speed is even more critical—although the sail combinations are not that different. A heavy-weather sailplan might combine a triple-reefed mainsail with a staysail or storm jib tacked well back from the bows; as the wind increases the mainsail may be handed altogether, with the typical deep stackpack acting as a “fourth reef.” If the cat has a wing mast, that in itself can act as a storm sail. Many cruising sailors, especially in the gale-prone waters of northern Europe and the Pacific Northwest, opt to have a third reef built into their mainsails. Where gales are frequent but seldom long-lasting, a third reef gives you the option to depower the mainsail without going to the hassle of rigging a trysail. Sailing being what it is, opinions can be sharply divided on the third reef/trysail debate. Many sailmakers believe“if you are going offshore, storm sails are a must, and even part of a boat&apos;s safety equipment, as opposed to part of the sail inventory. Then there are those who recommend having both a third reef and a trysail. Theory is all very well, but we wanted to know what sailors who are actually out there making long ocean passages carry and use in the way of storm sails. 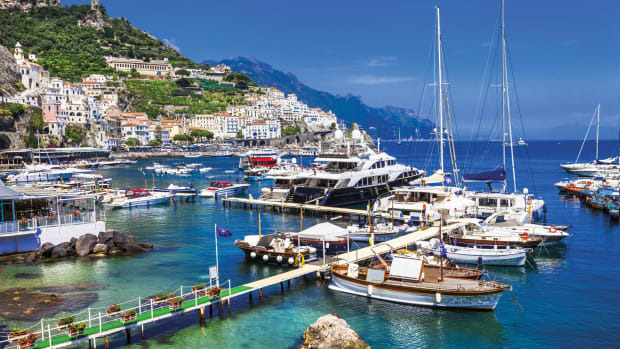 We asked the World Cruising Club to survey veterans of its long-distance rallies—the Atlantic Rally for Cruisers (ARC), the World ARC and the Caribbean 1500—to find out more about real-world bluewater storm-sail wardrobes and practices. The responses may surprise you. Want to Learn About Safety & Rescue at Sea? The goal of “Safety and Rescue at Sea” is to prepare captains to be as safe as possible when heading offshore. To be sure, there are plenty of specific tips, but the real value of the course is the philosophy of safety and risk that it imparts. Mario Vittone doesn’t just teach what to think about safety but how to think about it and how to parse risk.  This is a course for novices and experienced skippers alike. COURSE BEGINS May 21, 2018.